My week was a mix of good and not so good, and I take sole responsibility. I started the week taking a stroll to experience the joys of the Free Readers Association (FRA). This lot never, ever buys the dailies but they get to read every single tabloid on the stand. They are a mix of literates and semi-literates and everyone’s opinion is in turn considered the best. Once in a while, the voice of a particular elder prevailed; some say he is a Professor of philosophy. So, when I arrived, the subject of intense discussion was the current ruling political party and its strongest opposition. “This government has failed the people, they must go!” the tall slim fellow commented. “Yeye! Wetin you know, is it a government which has been there for three terms, with nothing major to show for it, who we should vote for?” Another tall round guy responded, looking very angry. An argument followed immediately, a call took me away from the spot, making me miss the hottest part of the discussion; when I returned, both men were covered in blood and sweat. Prof, the elderly man was addressing them. “You see, this behavior you have exhibited is a clear sign of a deficiency of the mind. The energy could have used to earn some extra bucks has been expended on a subject that you have little or no understanding of. Politicians are friends, either way you see it, after the elections; they have a way of coming back together,” Prof said. Throughout Prof’s admonition, there was dead silence from the crowd, save for the honking of cars from the nearby road. The two, measuring about the same height, sober and tired, hugged each and departed to wherever. My take on this is that there is absolutely no reason to engage in a fight because somebody has a contrary opinion to yours. On Saturday, I decided to spend the day with my football tribe. Not being a big football fan, it is uncommon to see me around places like viewing centers. And if you do ever find me there, it will most likely be for a different purpose. 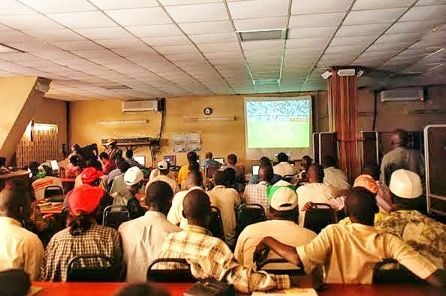 I went to the viewing center with Kenny and Ahmed, my ardent football following friends to watch the match between Chelsea and Newcastle where the room was jam-packed. The old air-conditioner could barely handle the heat oozing from these lovers of the round leather ball game. It was a mix of artisans, professionals and miscreants; the entry pass was a bottle of drink. For most part, it was Chelsea’s game and the Newcastle fans were not finding it amusing; I could tell because of the types of comments being passed. A group of young men in their early twenties, had been staking money at different points in the game and consequently their table was littered with drinks and naira notes. At the exact moment that the final whistle blew, their table was thrown by a disgruntled member of their league. Money flew in the air as glasses and beer bottles crashed onto the marble floor, sending glass shrapnel across the room. A small man, apparently from the same table picked up a bottle, smashed it and dashed at one of his colleagues. He didn’t reach him before he was taken off towards the security post. We all came out to the waiting hands of the police and had to explain ourselves before we could go home. At the end of the day, I had a piece of glass lodged in my leg, I lost precious time but the joy of being in the midst of football fans did not elude me. The closest I got to owanbe last weekend was a visit to Mr. Tayo Akintan, when he hosted me and Aare Oladeinde Ariyo of the Revival and Revitalization Centre for Yoruba language. It was a grand reunion as both men had not seen each other in many years. It was Sunday evening and a goat meat pepper soup was already waiting. Normally, one bowl of the soup would have been fine but with the deliciousness of it, we asked for more. Nothing works better than chilled red wine and a bowl of pepper soup. Next was boiled plantain in water leaf sauce, moderately mixed with little or no water and another bottle of chilled wine. I doubt if any owanbe would offer as much attention. When I arrived home, the lady of the house ran off to the Muritala Muhammed International Airport to pick her twin sister and her daughter. They returned, making it a bigger party and madam promptly prepared amala and ewedu for dinner. By the time the day was done, I could feel the impact of the excess weight this family’s great hospitality had on me! How did your week go? Would you like to share? We would be glad to be a part of your experience sometime, so please don’t hesitate to give us the lowdown. As you happily continue your week, don’t hesitate to make someone smile at any given opportunity.